The Bug is Turning One! We’re getting geared up for – can you believe it? – Paige’s first birthday! Invitations to her birthday party are going out in the mail this week. You can RSVP in the comments on this post, or by emailing me or by calling 812.890.4161. Please RSVP by August 15 so I know how much food to make! It’s going to be a fun, casual party with snacks, drinks, and – of course – cake at Shelter #2 in Murdock Park in Lafayette. 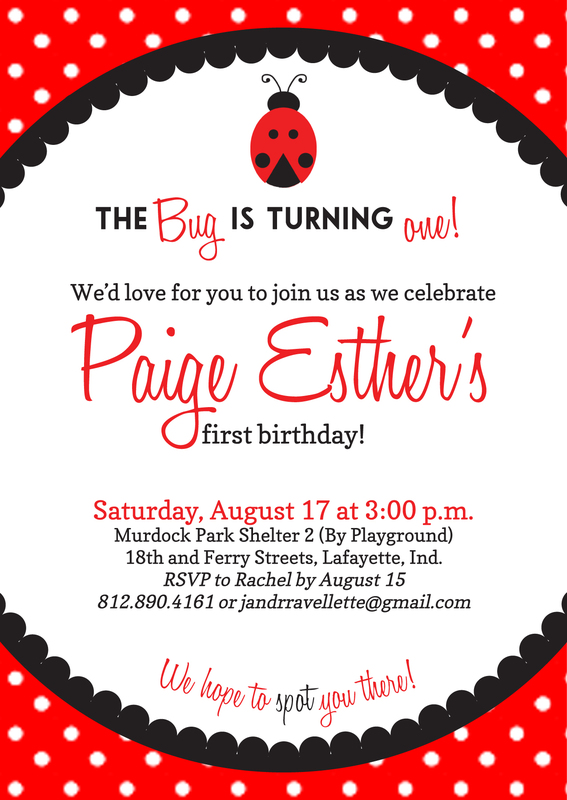 We’re looking forward to celebrating our sweet Paige-Bug with family and friends and we hope you can join us. She doesn’t have any Berenstain Bears books yet. Paige also doesn’t have any Curious George books yet. Eric Carle: The Very Hungry Catepillar; Brown Bear, Brown Bear, What do you See? Wooden Puzzles with Big Pieces (you know, the pieces with the handles on them, like this awesome puzzle from our favorite toy company, Melissa and Doug). Paige loves to push things around the floor, and toddler cars (not little matchbook cars, please!) like these wooden ones would be fun for her and not take up a ton of space. Please don’t read that list and think we’re greedily asking for a lot of things for Paige. Trust me, our sweet little girl (the first grandchild on both sides… let’s all say “spoiled” together!) is not wanting for anything. We just wanted to help give ideas to people who wanted to get her a gift. Posted in Family News, keeping up with baby! I can’t believe it’s been a year! Happy Birthday to your sweet girl from Bton!